Ask fellow campers about "Chincoteague Island KOA" and nearby attractions. Very nice clean campground. Last time we stayed it was Maddox family campground. It has been updated greatly. We didn't use the bathhouses, but did look in them. They we're very nice, and clean. They always have activities planned. They have a water park which is not included, but available at a discounted rate. They only negative is the sites are tight, and close. The sites are just long enough for our trailer by itself. You have to park the tow vehicle next to the trailer. We camped at Chincoteague Island KOA in a Travel Trailer. Chincoteague national park, and downtown Chincoteague. We really liked this KOA. First the staff was great. The grounds were clean, nice amount of shade. The dog park, while on the small side was clean. Nice camp store. Plenty of things for children. My only complaint (-1 star) is the tent campers walking through the sites to use the restrooms. They need to have dedicated cut throughs and make it clear at check in not to meander through other campers sites. The location can't be beat, and makes it worth the cost. The power was consistent. When we go back to Chincoteague we will be staying at the KOA. 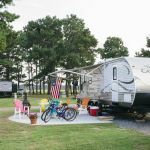 We camped at Chincoteague Island KOA in a Fifth Wheel. The bathrooms needed to be cleaned more than once a day. There are A LOT of tenters, and the load on the bathrooms is too much. The only other complaint is that there needs to be a posted speed limit throughout the campground. People were driving entirely too fast for a campground. I even saw employees going very fast on the roads. We were in site 9, I don't recommend this site. It is weirdly located across from a cut through path, so that we had a constant flow of people through our campsite, thinking that this was an extension of the path. We positioned golf carts and chairs so that maybe people would realize, to no avail. I am sure that this isn't isolated but probably happens all the time. The location is great: really close to the entry to National Seashore, and you can see the lighthouse from the campground. 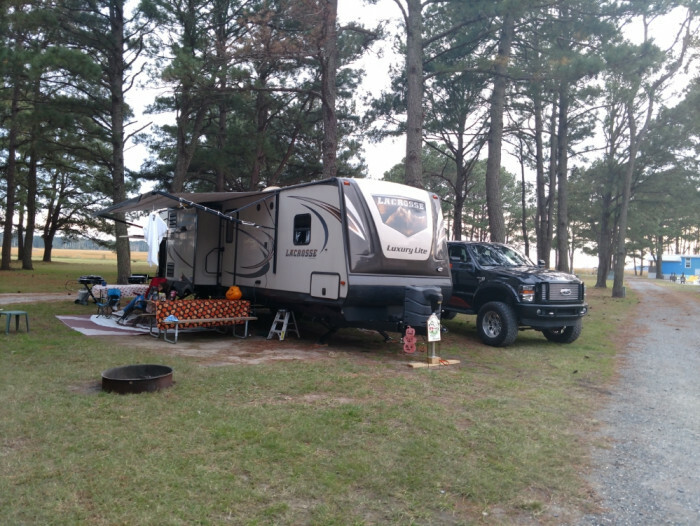 We camped at Chincoteague Island KOA in a Fifth Wheel. Lots of room for improvements, lot of construction still going on, hammers, drills, saws on the cabins in front of us. The pier is nice, kayak launch (well, lets say if's its high tide or right after a monsoon you might have enough water to launch) is just a mud flat. Once the water park is open I'm not sure I'll stay here, more traffic and noise. The patio sites were very nice, love the new furniture (bright and cheery). We have a toy hauler w/back deck and we barely fit with the ramp closed. In order to get golf cart out it was necessary to lower the ramp which extended into the road blocking traffic. Since it was off season, not an issue. Can't say I would stay here during the busy season. We camped at Chincoteague Island KOA in a Fifth Wheel. Assateague Park and the lighthouse views are lovely. Wonderful place to stay. We stayed 3 nights, Thu-Sat. Lots to do around the area. Staff was great. Sites were somewhat uneven and sewer connections seemed a bit higher than normal. Price also seemed a bit high for Sept time frame. All in all, a goof trip and we will return. 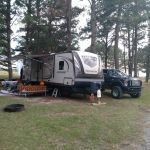 We camped at Chincoteague Island KOA in a Fifth Wheel. All and all, we were pleased with our week long stay. Some sites are tight, but ours was fine. Our biggest complaints: they desperately need to put up some sort of barrier to block the extremely bright and annoying McDonalds parking lot lights, could use some work on the road coming into the campground, and the kayak launch needs a ramp so that it's accessible at all tides, not just high tide. Staff was very pleasant, facilities were clean and new, location is fabulous (2.5 miles to downtown and 2 miles to the beach). We would recommend it and would hope to see the improvements suggested above! We camped at Chincoteague Island KOA in a Travel Trailer. We stayed for 1 week in site 216. The sites are pretty typical for a KOA. There is no cable, but we were able to get over the air channels. The power worked well, but the water hookup was almost on the ground. The real issue was a huge puddle of sewage overflow under our hitch, tv and camper when we were hooking up to leave. The site next to us also had this issue. The staff are all extremely friendly. There are new office/event building, laundry rooms and bath houses that are very nice. Small dog park that my dog enjoyed. Kayak and paddle board rentals were nice. There are alot of tent campers at this campground. A large number of campers had no problem walking through your campsite to get where they were going, which we have never really encountered before. Again, I wish I could rate this higher, but not until the sewer problems are taken care of. We camped at Chincoteague Island KOA in a Travel Trailer. A shuttle will take you to various places in town and to the beach. Good that its a KOA but they still need to make a lot of improvements. They pack The Campers in like sardines.For the price my site was shells and sand and very unlevel. Every time we went in the motorhome sand was tracked in. Same with the new showers they have put in place full of sand and dirt. Noticed them clean the restrooms and they was more dirt after the cleaning then before. People constantly riding golf carts creating a ton of dust as the 10 mph speed limit is not enforced, this includes the employees. Cars and people cutting thru sites all the time. Need a road for the people in tent section across A sites to go to restrooms ,suggest sites A10 or A11 for this. Watch out for Young kids riding push carts after dark with no lights.Cable and Wi-Fi was spotty depending on time of day. If they take suggestions for more improvements like paving roads and less sites as well as a new restroom for tents campers then it could become a top notch campground. We camped at Chincoteague Island KOA in a Motorhome. 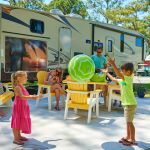 Since no one has reviewed this campground since it became a KOA, take the past reviews with a grain of salt. This park is experiencing growing pains at this point in time. The old sites seem ok, but the "premium" sites with a "view of the lighthouse" are not quite as advertised. They all face the wrong way. Instead of a view of the lighthouse, we had a view of the porches on the row of cabins. For the first time since we started traveling, I asked to move to another site. The staff accommodated me right away and we're happy. They are re-wiring and re-plumbing the entire park. There are no cable outlets yet, but it looks like the cable is run. Power, water pressure and WiFi are all working, although when we both went on the WiFi it did degrade. Another couple couldn't find their sewer tap, and the consensus was that it was buried in the dirt somewhere. They had to re-hook and move to another site. This park is a work in progress. As with most KOAs, it's overpriced for what you get. We camped at Chincoteague Island KOA in a Motorhome. Perfect location, excellent staff, clean grounds. Entire location will undergo a brand new renovation this November to be unveiled in May of 2017, barring delays. We camped at Chincoteague Island KOA in a Motorhome. Woody's Beach BBQ is a MUST followed by Island Creamery! OK park in tourist area. Charged me a $15.00 early check inn fee. At 1:00 PM for a 2:00 PM check in. I complained at registration and was told: "You're Lucky It wasn't $25.00." Interior non paved roads very rough. Heavy rain caused me to wade in 1 foot of standing water to pack up. We camped at Chincoteague Island KOA in a Travel Trailer. This is a campground not an rv park. Sites are wide and angled so you are not looking in another coach. Lots of trees and our site was level. Water pressure is good. Plus on this park is its distance to Chincoteague National Wildlife Refuge and beach. Wifi was good on our site. We camped at Chincoteague Island KOA in a Motorhome. Crab cakes are excellent at The Village restaurant just around the circle on the left. Arrived during a monsoon rain storm, lots of flooding. However, the staff was more then accommodating during our arrival. Checked in and had no issue parking on our assigned site. As anyone who has stayed at Chincoteague knows it can be buggy, but right after a rain storm they swarmed so setup was done as quickly as possible. There is a good amount of seasonal sites on the property. The store had a lot of typical camping stuff, was disappointed that there was no campground specific merchandise (shirts, coozies, etc). We like to collect things from the various campgrounds we visit. Location could not be better on the island as it close to all of the local attractions. Was very cool to see the Assateague Lighthouse light scanning the night sky from your campsite. Would visit Maddox Campground again in the future. We camped at Chincoteague Island KOA in a Travel Trailer. Very nice campground. No problem from making reservations to check in. Office staff was very friendly. Park was very clean; trash pickup four times a day. Quiet at night. Close to National Park . We camped at Chincoteague Island KOA in a Motorhome. 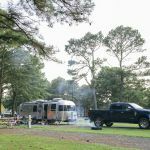 This is an older campground close to the national seashore. The website states that there is cable hook ups, but it is only at the seasonal sites, no Wi-Fi. Our site was fairly level pull through in the G section. Staff was friendly in the office and trash is picked up a couple times a day. The facilities were old, but clean. This seems to be the case with all the campgrounds on Chincoteague. The bug guy comes to spray nightly. I would probably try to stay elsewhere if in the area again. We camped at Chincoteague Island KOA in a Travel Trailer. Are you affiliated with Chincoteague Island KOA ?